“Maybe we should just sit this round out.” That’s what a long-time supporter of two states said to me the other day questioning whether, with all the upheaval in the Middle East, now is really the time for Israel to pursue a two-state solution with the Palestinians.Underlying the question is the assumption that if the risks of pursuing two states seem too great, maybe it’s better to just accept the status quo. I’ve begun likening Israel’s situation to being on a shaky raft heading downstream with a rapid current. You know the stream leads to a steep waterfall and that your life is at risk if you go over the cliff. But abandoning the raft is risky too. There’s no guarantee you won’t drown en route to the shore. Maybe there are rocks? Perhaps dangers await on the shore? In considering those risks, however, you can’t lose sight that sitting in the raft isn’t an option. It’s heading off a cliff. Let’s acknowledge that Israel is consciously choosing to sit in the proverbial raft. Sure, the risks around Israel are real. The regional picture is murky at best. It’s unclear where the revolts in the Arab world will lead. Who can say when or whether Syria will collapse and what the consequences are if it does? Who knows what will come next in Egypt and whether the peace treaty will hold? Will Iran develop a nuclear weapon? Will its autocratic regime endure? With such uncertainty, it’s understandable to say why take risks? Can’t we just sit this round out? When one compares the risk of doing nothing – which leads eventually to the end of Israel’s Jewish and democratic character – with the risks of actively pursuing two states now, you recognize the strategic and moral imperative to act. It’s the unsustainable status quo that motivates our 2012 campaign to define the “Future of Pro-Israel” as active pursuit of a two-state solution. 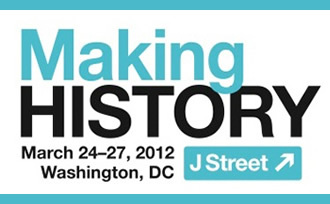 And it’s what motivates us to come to DC by the thousands for our March 2012 Conference, Making History. And it’s why the Quartet, the U.S., Israel and the Palestinians should take the most recent round of peace talks much more seriously. Unfortunately, we worry that the Israeli newspaper Ha’aretz is right to say that the government of Israel’s approach to the talks is to simply kick the can down the road by arguing over the deadline for submitting its proposal on borders and security rather than putting its proposal forward next week. The Palestinians are threatening to abandon the talks if Israel misses next week’s deadline and to resume their quest for independence at the United Nations. The US, hobbled by election year politics, won’t even stand up to say there’s a hard deadline and both parties need to meet it. Maybe they secretly congratulate themselves on avoiding the challenge of putting a map on the table that identifies which settlements will go if there is to be peace. But does this really advance Israel’s long-term interests?